The download includes the five tracks, in addition to the full size album art and information document. 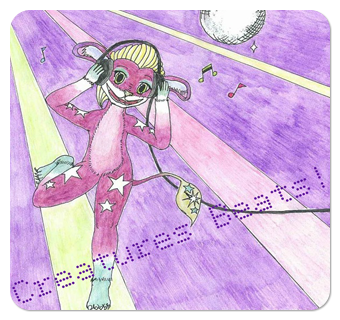 From C-Rex: "I first started work on Creatures Beats back in August, and it includes four Creatures-related songs, and an intro. The intro centers around two Norns who have discovered an old record, which is meant to represent members of the Creatures Community rediscovering Creatures following the announcement of Creatures 4. The EP couldn't have been possible without the help of SpringRain, the album artist; Reikya, for testing the album and providing me with useful feedback; Jessica, for hosting the CCSF 2012; and Lacota, Dr. Draconian, Caleb Mazelevskis and Bug for creating the very first Creatures Album, Creatures Dance Jam, ten years ago. I dedicate this EP to the Creatures Community for always being there for me, no matter what. Further information may be found in the Track Listing & Info document." SpringRain: I think the album art was a perfect touch, and it fit right in with the color theme for the first day! For anyone else who would like some Creatures music, C-Rex also extracted the Creatures 2 Soundtrack to produce multiple tracks. Coupled with Creatures Beats, it makes for a great musical selection! Welcome to the CCSF 2012! This annual event celebrates the Creatures games, as well as the amazing community that has stayed alive for well over a decade. The Creatures Community Spirit Festival 2012 is scheduled to take place from November 1-14, 2012, and will include all sorts of activities and downloads. Enjoy this wonderful festival, made possible through the hard work and dedication of all!